After dyeing my last skein of yarn, the gloriously purple Blue Faced Leicester 4ply yarn, I decided that it would match incredibly well with one of my favourite shawl/scarfs, the Fluvial. As I had very itchy fingers for this yarn, I didn't even stop to think, and immediately cast on another Sockhead Hat. 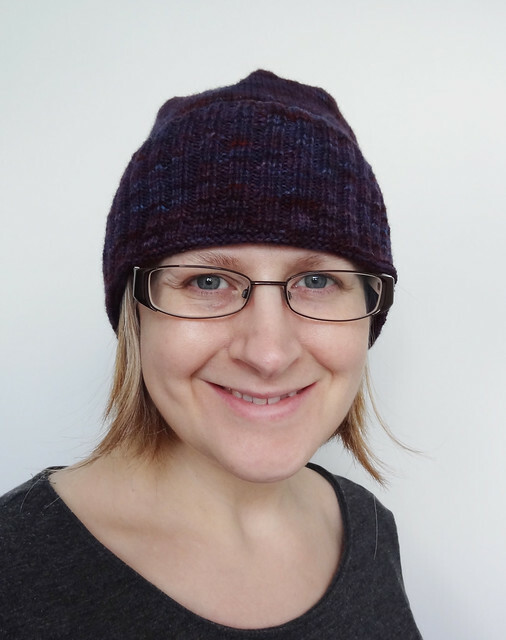 I love this pattern, it's simple to knit and the hat suits me really well, and gives me options on how warm I want my ears to be. One thing I learnt from my last version of this pattern, is that I wanted the body of the hat to be shorter. Instead of knitting the stocking stitch portion of the hat to 9", I knit it to 7" before carrying out the decreases. This means the hat is almost beanie like when the brim is rolled back. It means the body of the hat isn't pulled tight, so it traps lots of air around the head to help keep me warm. I adore this hat. The fabric is even and smooth and I didn't have to block it at all. I know that in future, if I get a chance to buy BFL yarn to dye again, I grab it with both hands. It dyes well, without there being too much risk of felting and it is a lovely yarn to knit with. When I'd finished my hat, I had some of the yarn left over and I didn't want to waste any of it so I decided to add it to my "leftover sock yarn, which will be used one day, somehow" bag. This bag was initially intended to be used to make a Bee Keeper's Quilt, but after a few hexipuffs, I found it just didn't appeal to me as a long term project. The pile has threatened to topple over a few times, and when I added the scraps from this project to the pile, the bag tipped over. I decided it was a sign, and found a new project to use it. I'm doing the Sock Yarn Square by Shannon Geddes pattern, but instead of knitting into the back loop of the yarn over increases, I'm just leaving them open. I'm knitting 15 increase rounds to get a nice sized square and I'm using 2.75mm needles, and knitting with 2 circular needles. I think this project will work better, for me, than the Bee Keeper's Quilt. I don't need another heavy blanket, I've already got a couple. What would be nice, is something lighter weight and these squares would form a light and pretty blanket. The pattern is straight forward and can be easily done while socialising. 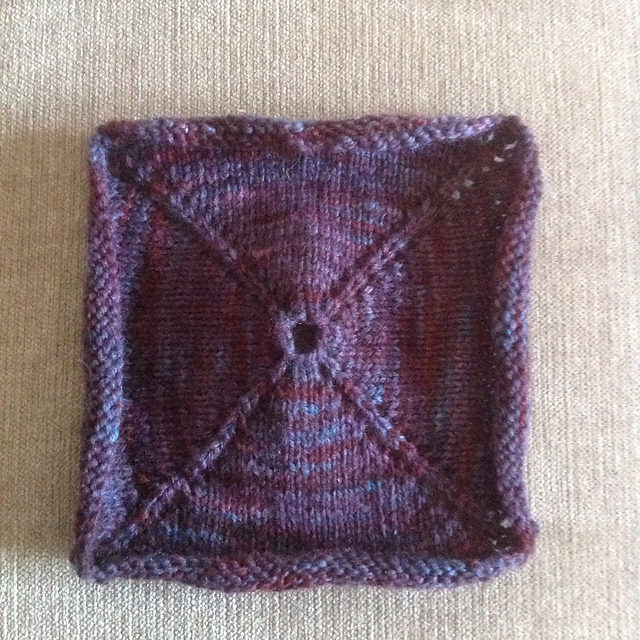 I think you will be seeing more of these squares than you did of the hexipuffs. 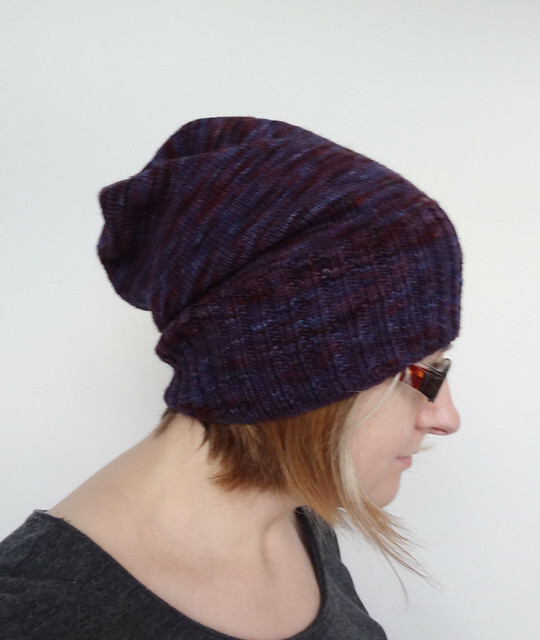 In the meantime, I shall continue to enjoy my new hand-dyed hat!